Techniques that render tissues as clear as glass and swell them to several times their original size are giving unprecedented access to the inner workings of biological systems. Michael Eisenstein is a freelance writer based in Philadelphia, Pennsylvania. In March, researchers in Japan mapped the cellular organization of the mouse brain in unprecedented detail. Systems biologist Hiroki Ueda at the RIKEN Center for Biosystems Dynamics Research in Osaka, Japan, and his team created an atlas of the mouse brain using a technique called CUBIC-X, in which they chemically labelled every cell in the brain, then rendered the organ crystal-clear while also expanding its size tenfold1. From there, they used sophisticated imaging techniques to compile a comprehensive 3D neuronal survey — of some 72 million cells in all, Ueda says. The resulting atlas reduces the brain to a compact database of cellular addresses, which the team used to explore changes in various brain regions during development. Moving forward, the atlas could drive deeper explorations of brain structures that control behaviours such as the sleep–wake cycle. CUBIC-X is just one component in a growing toolbox of such methods, which exploit readily available chemicals to provide researchers with a window not just into the brain, but into virtually every organ in the body. Some are tissue-clearing methods that make opaque tissues transparent, whereas others complement tissue clearing with a proportional size increase that exposes molecular details to conventional microscopy. The choice comes down to the scientific question. There are many ways to achieve similar ends, and users should investigate the strengths and limitations of different methods before deciding which to use. The hunger for tissue-clearing techniques originated with neuroscientists, who were frustrated by their limited ability to trace the snaking routes of axons and dendrites in the brain. A better approach would be to make the tissue transparent and then image it intact. But only in the past few decades have molecular reagents, genetic strategies and imaging techniques advanced far enough to make that possible. When it comes to illuminating the brain’s interior, lipids are public enemy number one. As light passing through an aqueous solution encounters a lipid surface, the change in refractive index causes it to bend and scatter. “Think about Jell-O [a jelly]: it’s made mainly of proteins and it’s translucent,” says Gradinaru. “But if you add cream to the Jell-O, it becomes opaque. That cream is made of lipids.” Cell and organelle membranes are made mainly of lipids, as are the myelin sheaths enveloping axons. Clearing the brain entails eliminating these molecules, while physically stabilizing the molecules that remain behind. German anatomist Werner Spalteholz first demonstrated a strategy for clearing opaque tissues in 1911, using chemical solvent treatments that eliminated light-scattering biomolecules. But that method was incompatible with today’s fluorescent reagents, and damaging to tissue structures. In 2011, Hans-Ulrich Dodt, a brain-imaging specialist at the Vienna University of Technology; Ali Ertürk, now at the University of Munich, Germany; and Frank Bradke at the German Center for Neurodegenerative Diseases in Bonn described one of the first modern clearing techniques. Called 3DISCO, the method is a spiritual descendant of Spalteholz’s protocol, using a gentler cocktail of chemical solvents that dissolve lipids while preserving cellular structures and dehydrating and hardening the specimen into a clear framework that retains the tissue’s original structure2. “We think that the solvent-based methods are the most reliable in terms of reproducibility and cost — the first time you do it, it works,” says Alain Chédotal, a developmental neuroscientist at the INSERM Vision Institute in Paris. Solvent-based methods are generally best suited for use with fluorescently tagged antibodies as the reporter molecules, because genetically expressed fluorescent proteins tend to yield a weakened signal or be denatured by such treatments. But a new variant of 3DISCO from Ertürk’s team overcomes that problem. vDISCO uses dye-labelled ‘nanobodies’ to boost the signal from fluorescent proteins in solvent-cleared tissues — an approach the team used to clear and image intact mice (see go.nature.com/2tk6hr3). Another widely used tissue-clearing option is CLARITY, which Gradinaru helped to develop as a graduate student in neuroscientist Karl Deisseroth’s lab at Stanford University in California in 20133. The Deisseroth lab makes extensive use of fluorescent proteins in its neuroscience research, and sought a more ‘naturalistic’ clearing approach that minimized damage to biomolecules of interest. CLARITY uses detergent to eliminate lipids, while reinforcing the tissue infrastructure with polymers that form a water-based hydrogel. “All of those monomers hold hands with each other and they lock in the proteins as well,” explains Gradinaru, “and then you can come in with that gentle detergent to take the lipids out.” Early versions of CLARITY were technically challenging, requiring an electrical field to actively drive out detergent-encapsulated lipids. But Gradinaru subsequently devised a simpler alternative that perfuses the animal’s vasculature with clearing solution to achieve the same effect. For the CUBIC family of techniques, Ueda developed yet another approach4. CUBIC exploits ‘hydrophilic’ chemicals that draw water into the fixed specimen while pushing dissolved lipids out. As with CLARITY, the method preserves the structure and function of fluorescent proteins while clarifying the sample. But the methods aren’t limited to the brain. “Much to our surprise, most of the rodent organs turned transparent within a few days,” says Gradinaru of her work in developing perfusion-based CLARITY. “It resulted in the whole body being cleared except the skin and bones,” she says. When it comes to tissue clearing, bone poses a particular challenge, Gradinaru says, because calcium continues to reflect light even after conventional clearing. But additional treatments can eliminate this problem. Ueda, for instance, has shown that EDTA, a commonly used laboratory chemical, efficiently removes calcium from bone. Gradinaru’s team has also developed a bone-clearing CLARITY variant. Such methods make it possible to perform whole-body imaging of intact specimens, and researchers have applied them to track rare populations of stem cells or tumour metastases, and even to trace the developing vasculature and peripheral nervous system in first-trimester human embryos. As samples get bigger, however, microscopy can become a bottleneck, and researchers must balance research goals with practicality. Light-sheet microscopy is one popular solution. “You’re scanning a plane of light through the tissue rather than a point, and that greatly accelerates the imaging,” says Deisseroth. So, too, is the physical shrinkage that accompanies certain clearing methods. In 3DISCO, dehydration can reduce sample size by up to 50%. 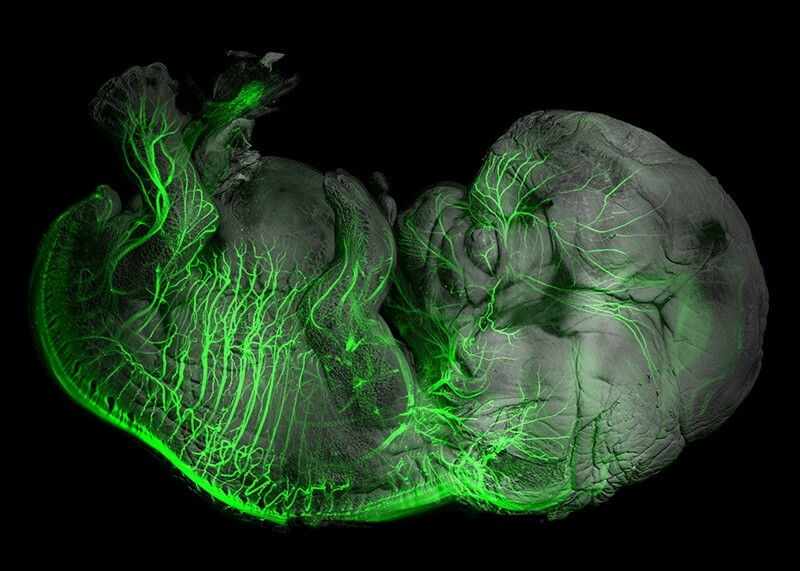 “That means we can image a whole human embryo in 3D in one shot,” says Chédotal. Clearing is a valuable starting point for tissue imaging, but to make out fine molecular details, researchers also needs the means to ‘zoom in’. Conventional light microscopes are unable to distinguish molecules separated by less than the ‘diffraction limit’ of light, around 200 nanometres — a problem that led to the development of technically sophisticated super-resolution microscopy approaches. Ed Boyden, a neurobiologist at the Massachusetts Institute of Technology (MIT) in Cambridge, was joking when he initially proposed an alternative approach — ‘blowing up’ the brain. But soon he saw real potential in the idea. “All the proteins in the cell are jam-packed together, and if we expand them apart from each other, maybe we could see them better,” he says. Boyden’s team drew on decades of research into the properties of hydrogels that undergo proportional expansion on hydration. In their first-generation ‘expansion microscopy’ method5, published in 2015, samples are treated with specially designed fluorescent labels recognizing target molecules of interest, and then incubated with a polymer solution that forms a hydrogel matrix. The labels attach to this matrix, locking them into position relative to each other. Finally, the surrounding tissue is broken up through chemical or enzymatic treatment, and hydrated to swell the gel matrix. The resulting expansion leaves the labels in the same relative position, but separated by up to four times their original distance. As a result, molecules that previously were too close together to distinguish can now be discerned using standard fluorescence microscopy. For many biologists, the method seemed too good to be true. “My first thought was: ‘This is crazy, how could that even work?’” recalls Joshua Vaughan, a bioimaging researcher at the University of Washington in Seattle. But he was intrigued enough to try it — and subsequently devised an alternative version that uses conventional fluorescent proteins or antibodies rather than specially designed labelling reagents. Later variants include an iterative method from Boyden’s group that uses two rounds of treatment to achieve up to 20-fold expansion, and an alternative method developed by Kwanghun Chung, a biomedical engineer at MIT, that denatures biomolecules rather than digesting them, which better protects endogenous proteins and the integrity of tissue structures6. “We use this method for connectivity mapping, which requires preservation of neuronal fibres: once you cut them, you lose information,” says Chung. Crucially, these various methods also induce tissue clearing, allowing users to peer deep inside their super-sized samples. Vaughan’s team has applied expansion microscopy to specimens ranging from fruit-fly larvae to the human kidney, and other researchers are applying it in the clinic (see ‘Transparent tumours’). But it can take considerable trial and error to ‘tenderize’ a new specimen for expansion. “Human kidney has some tough connective tissue,” says Vaughan, “so we just had to keep trying enzymes to get at it.” It is also essential to make sure that expansion really is ‘isotropic’, or equivalent in all directions. But with care and practice, remarkable uniformity can be achieved. “Our results show that distortion is less than 5%, which is equivalent to, or lower than, the distortion you get during sample-mounting,” says Chung. Cancer medicine is advancing fast, guided by new insights into immunology and genetics. Yet cancer pathology remains rooted in the past, relying on staining individual slices of tumour tissue for microscopic examination. “It’s very conservative, and the young clinical scientists are a little bit depressed by that situation,” says Hiroki Ueda, a systems biologist at the RIKEN Center for Biosystems Dynamics Research in Osaka, Japan. Tissue-clearing strategies also offer insights into tumour biology. Neurobiologists Karl Deisseroth at Stanford University in California and Per Uhlén at the Karolinska Institute in Stockholm applied a variant of the clearing technique 3DISCO to get an unprecedented view of tumour heterogeneity — a factor that can profoundly affect treatment response. And at the Massachusetts Institute of Technology in Cambridge, neurobiologist Ed Boyden and his team have shown that the tissue-clearing and resolution boost from expansion microscopy enables more-accurate diagnosis of neoplastic lesions that can herald early-stage breast cancer. Both Boyden and Deisseroth have founded companies to advance clinical development of their techniques, and some practitioners of tissue clearing already foresee the beginning of the end for conventional methods. “Young pathologists are so excited about our technology,” says Ueda. “It seems to be the future to them.” M.E. For cash-strapped biologists, expansion microscopy promises super-resolution imaging without the costly hardware. “Basically anybody can do this,” says Helge Ewers, a cell biologist at the Free University of Berlin, “and any normal microscope can become super-res capable.” Crucially, the reagents required are not particularly exotic, even if some dabbling is required to identify the right formulation. Chédotal notes that clearing an entire mouse costs roughly a dollar. The equipment requirements are equally modest. “You just put the organ into the chemical, and usually just an incubator and shaker are needed — most labs have such devices,” says Ueda. Expansion is more technically demanding than clearing-only methods, but Boyden and others have published ‘best practice’ protocols to help eliminate guesswork in expansion microscopy7. “It’s not quite a ‘cookbook’ yet, but we’re getting there,” Boyden says. Researchers are beginning to explore the potential rewards of such methods. Several brain-atlas initiatives are now under development, with the goal of going beyond cellular censuses to chart the interconnections between cells. Others are applying clearing and expansion to DNA and RNA, allowing them to survey gene expression as well as proteins. Biophysicist Xiaowei Zhuang at Harvard University in Cambridge, Massachusetts, devised an expansion-microscopy-based strategy that allowed her team to quantify expression of more than 100 genes at the single-RNA level8. In parallel, Deisseroth and colleagues have developed a technique called STARmap, in which up to 1,020 different genes can be directly sequenced within cleared brains9. Murakami, T. C. et al. Nature Neurosci. 21, 625–637 (2018). Ertürk, A. et al. Nature Protoc. 7, 1983–1995 (2012). Chung, K. et al. Nature 497, 332–337 (2012). Susaki, E. A. et al. Cell 157, 726–739 (2014). Chen F., Tillberg P. W. & Boyden, E. S. Science 347, 543–548 (2015). Murray, E. et al. Cell 163, 1500–1514 (2015). Asano, S. M. et al. Curr. Protoc. Cell Biol. 80, e56 (2018). Wang, G. et al. Sci. Rep. 8, 4847 (2018). Wang, X. et al. Science 361, eaat5691 (2018). Nojima, S. et al. Sci. Rep. 7, 9269 (2017). Tanaka, N. et al. Nature Biomed. Eng. 1, 796–806 (2017). Zhao, Y. et al. Nature Biotechnol. 35, 757–764 (2017).